A yurt is a round structured developed in the Mongolia region over the last 3,000 years by the nomadic cultures of the region. This simple but hardy design has brought the yurt all over the world. What was once a structure only hand built by Mongolian nomads, yurts are now being built by many craftsmen and yurt kits are now available from many different manufacturers. 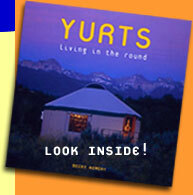 You will find quite a bit of information about yurts here, but we also have links to more reading material in our bookstore. Becky Kemery originally published this website before her passing, and the Yurt Forum now maintains and cares for it. We hope you find what you need, but if not, please ask us in the forums and we will do what we can to help you out! 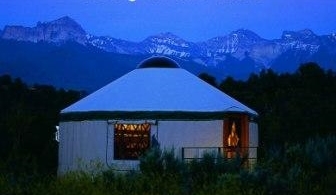 Yurt Kits | Yurt Costs | Yurt Forum | Used Yurts For Sale | Yurt Sales | What is a Yurt?